There are some pretty elaborate ways to make a watermark How to Watermark Images Using Photoshop How to Watermark Images Using Photoshop There are several options on how to watermark your images online, but using a web app can have its drawbacks. Instead, here's how to use Adobe Photoshop to make watermarks. 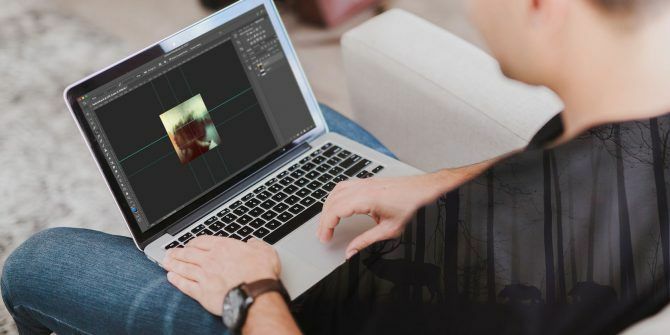 Read More in Photoshop if you’re looking for a subtle watermark, but if you need a quick option, you can create a simple watermark in Photoshop in seven easy steps. If you plan to use text as your watermark, you can add that text using the Text Tool How to Add and Edit Text in Adobe Photoshop How to Add and Edit Text in Adobe Photoshop Adding, modifying, and editing text in Adobe Photoshop could not be simpler. Read More . If you want to use an image or logo as your watermark, go to File > Place Embedded, navigate to the image you want to use, and click Place. For both text or image watermarks, you can use the Move tool (keyboard shortcut V) to place the watermark where you want it. To resize the image, select the Rectangular Marquee tool (keyboard shortcut M) and right-click on the image and select Free Transform. Hold down the Shift key and drag the handles at the corner of the image to scale it up or down. Hit Enter to save those changes. Once your watermark text or image looks the way you want it, open the Layers panel by going to Window > Layers. Click on the layer with your watermark text or image in the Layers Panel. Click the arrow next to the Opacity option and use the slider to bump the opacity of that layer down. You can also enter the opacity percentage manually. The opacity you choose will depend on your image. In the example below, I used an opacity of about 20% for the text. Once you have the watermark looking the way you want, go to File > Save As… to save a copy of your image with the watermark. Select JPG (or the original format of your image) from the dropdown menu and click Save. Don’t forget, if you’re going to use an image as your watermark, it’s going to need to be in PNG format Know When to Use Which File Format: PNG vs. JPG, DOC vs. PDF, MP3 vs. FLAC Know When to Use Which File Format: PNG vs. JPG, DOC vs. PDF, MP3 vs. FLAC Do you know the differences between JPG and PNG, or MP3 and FLAC? If you don't know which file formats to use, let us guide you through their distinctions. Read More . If you tried to use the same image in JPG format, it would include the white background from that image. If you don’t have access to Photoshop, don’t forget there are plenty of free apps and sites 13 Easy & Free Ways to Watermark Photos 13 Easy & Free Ways to Watermark Photos Have you ever needed or wanted to mark an image as yours to prevent others from duplicating it and/or claiming it as their own? You might already know that this is called watermarking. The process... Read More that make it easy to create a watermark. What’s your preferred method of watermarking your images? Let us know in the comments. Explore more about: Adobe Photoshop, Copyright. Thanks for this effective post and its actual idea about watermark photoshop. Great article! I'm just searching about it and finally reached your post & literally I get complete stuff about create watermark Photoshop. Your every step is cleared and easiest. Thank you so much for sharing it.